People with grit start with interest, practice hard, ally it to a common purpose, and retain hope at all times. Patience and resilience are the secrets of success. Grit is what goes through your head when you fall, down, and it’s what makes all the difference – not talent or luck. Interest: you have to find something you actually like, or think you might. Practice: those with grit indulge in deliberate practice – they set themselves specific goals and focus on the nasty stuff they find difficult. That means a clearly defined stretch goal, full concentration and effort, immediate and informative feedback, and repetition with reflection and refinement. Purpose: the intention to contribute to the wellbeing of others. Reflect on how the work you are already doing can make a positive contribution to society. Hope: learned industriousness is shown by people who deliberately train on more difficult tasks. Learned optimism assumes that something can indeed be achieved. Learned helplessness makes people not bother and/or give up too easily. Showing up is more important than innate talent. Many companies are distracted by talent, but it doesn’t count as much as grit. They are biased in favour of those they see as ‘naturals’, but they aren’t always the best people. Effort counts twice because talent x effort = skill, and skill x effort = achievement. That’s how people become the best in their field. If you want to be grittier, find a gritty culture and join in. if you want your people to be grittier, create a gritty culture. Passion is not just that you have something to care about. It is caring about the same ultimate goal in an abiding, loyal, steady way over a sustained period. Passion for your work is a little bit of discovery, followed by a lot of development, and then a lifetime of What do I care about, followed by experimenting with things. For the expert, novelty is nuance. Grit increases with age. This is because it only develops with persistence and experience. If you haven’t been knocked back, you can’t really demonstrate grit. 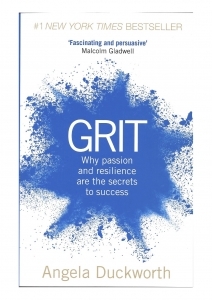 The more grit, the more life satisfaction people have. More than two thirds of adults are not engaged at work. Only 13% say they are truly engaged. Old joke: some people get 20 years of experience, while others get one year of experience twenty times in a row. There’s no development in that. Completing a task that requires grit is like “pushing a peanut across a very dirty kitchen floor with your nose”, according to author Joyce Carol Oates. There is a 10-question survey to work out your grit level. There is a lot of material on American Football and the US education system, which may be of limited appeal to UK readers.